Embracing in one common trajectory the major Baptist confessions of faith, the major Baptist theologians, and the principal Baptist theological movements and controversies, this book spans four centuries of Baptist doctrinal history. 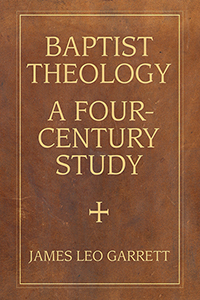 Acknowledging first the pre-1609 roots (patristic, medieval, Reformational) of Baptist theology, it examines the Arminian versus Calvinist issues that the General and the Particular Baptists first expressed. These issues dominated English and American Baptist theology during the seventeenth and eighteenth centuries from Helwys and Smyth and from Bunyan and Kiffin to Gill, Fuller, Backus, and Boyce and were quickened by the awakenings and the missionary movement. Concurrently, the Baptist defended distinctives vis-à-vis the pedobaptist world and the unfolding of a strong Baptist confessional tradition. Then during the nineteenth and twentieth centuries the liberal versus evangelical issues became dominant with Hovey, Strong, Rauschenbusch, and Henry in the North and Mullins, Conner, Hobbs, and Criswell in the South even as a distinctive Baptist Landmarkism developed, the discipline of biblical theology was practiced and a structured ecumenism was pursued. Missiology both impacted Baptist theology and took it to all the continents, where it became increasingly indigenous. Conscious that Baptists belong to the free churches and to the believers’ churches, a new generation of Baptist theologians at the advent of the twenty-first century was somewhat more Calvinist than Arminian and decidedly more evangelical than liberal.